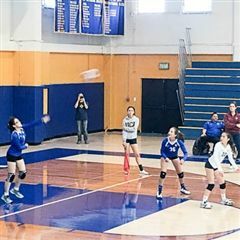 Once again, the Varsity Girls Volleyball team overcame many obstacles and triumphed over Woodside Priory in four games: 19-25, 26-24, 25-21, 25-12. The Varsity Volleyball had a strong showing against Pinewood on 10/18. The team celebrated the return of Lara B and Morgan C by winning in three games: 25-9, 25-6, 25-11. The team was led by Gianna P's 25 serve points (2 aces), Sophie L's 8 kills, and Sophia T's 11 digs. 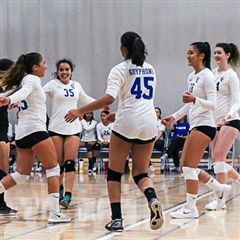 The Varsity Volleyball team traveled to San Jose to play Notre Dame. The team played very well, never giving up but losing in four games: 19-25, 15-25, 25-21, 25-27. The team was led by Sophie L's 14 kills, Chloe S's 15 serve points (4 aces), and Gianna P's 17 assists. The team was led by Sophie L's 18 kills, Florenz B's 14 serve points, 4 serve aces, and 14 assists, and Coco S's 12 digs, 12 serve points, and 3 serve aces. The team is now 16-6 overall, 8-1 in league. The Varsity won a hard-fought match versus Castilleja in four games: 25-14, 21-25, 25-19, and 25-14. Despite loosing the starting middle to an ankle injury in the third game, the team made some adjustments and fought hard for the win. The team was led by Sophie L's 16 kills, Florenz B's 19 assists, Coco S's 14 digs, and Gianna P's all-around play. 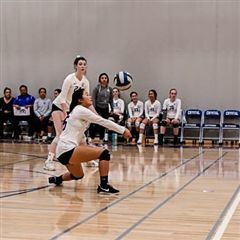 The varsity volleyball was successful in three games versus Eastside College Prep: 22; 25-19; 25-11. The team was led by: Gianna P's 9 digs, 10 serves points, and 19 assists; Sophie L's 16 kills; Catherine H's 4 solo blocks and 10 serve points (4 aces); and Chloe S's 12 digs. The team is now 14-6 overall; 6-1 league. What a great match volleyball match on Friday 9/28! The CSUS girls fought hard against a strong Mercy Burlingame team, but lost in five: 25-21, 25-21, 17-25, 22-25, 6-15. The team was led by Sophie L's 19 kills, Coco S's 17 digs, and Sophia T's 18 serve points and 4 aces. On Tuesday 9/25, the Girls Varsity Volleyball team was successful versus Pinewood winning in three sets: 25-12, 25-17, 25-11. Our middles, Catherine H and Hillary L, led in kills with ten kills each. In addition, the all-around play of both Gianna P and Flo B were key to the team's victory.